Carpet Cleaning - B AND B MAINTENANCE, INC.
Carpets do a great job of collecting dust and dirt, making them a breeding ground for allergens and pollutants that can make your employees and guests sick. Regular commercial carpet cleaning will keep the germs away and your carpets smelling fresh and looking great! Getting your carpets in like-new condition starts here! Schedule your free carpet cleaning quote! No matter what your carpet looks like or how bad it is, we have the tools and know-how to bring it back to life! Dry carpet cleaning involves the use of specialized machines to clean carpets with recently developed chemical technologies that permit no-moisture or "very low moisture" (VLM) cleaning, resulting in carpet beautification and removal of stains, dirt, grit, sand, and allergens. Clean carpets are recognized by our clients as being more visually pleasing, potentially longer-lasting and healthier than poorly maintained carpets. The most common method of carpet cleaning, extraction is great for removing dust mites, allergens and other organisms lurking in your carpet. This powerful cleaning method uses more water than low-moisture cleaning and requires a longer drying time. 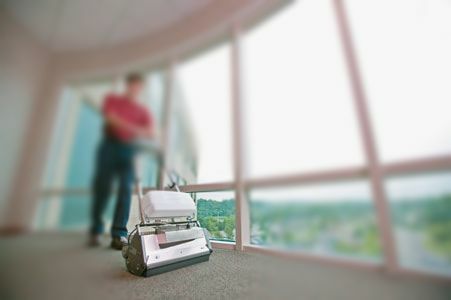 ​Deep extraction cleaning provides the most thorough cleaning of any carpet maintenance system. It does this while reducing detergent residue, a prime consideration when choosing a cleaning system. Extraction pumps force a solution of water and cleaning detergent into the carpet pile and recover the water and soil mixture with a carpet extractor. ​CONFIDENTIALITY NOTICE: The contents of this website and any attachments are intended solely for the addressee(s) and may contain confidential and/or privileged information and may be legally protected from disclosure. If you are not the intended recipient, you are hereby notified that any use, dissemination, copying, forwarding, or storage of this message or its attachments is strictly prohibited. Please notify the webpage administrator if you have received this website by mistake and delete this web address from your system. Access to this website by anyone other than the intended is unauthorized. The views, opinions, conclusions, and other information expressed in this website are not given or endorsed by the company unless otherwise indicated by an authorized representative independent of this website.